You might be surprised how often, when I’m working with agencies, and I’m told that something ridiculous was agreed with the client such as an absurdly low fee or rate card, unbelievable ‘free’ services, ludicrous payment terms, PO numbers coming after the campaign has been completed – I could go on…. Having worked with 120+ agencies I understand the challenges and commercial pressures you can sometimes be under. But the long term implications of these concessions can be massive and ripple well into the future, sometimes it seems as if forever. You’ve set a precedent with that client to solve a short term problem and it creates a long term problem. It’s like taking out a Wonga loan for 6 months at 1086%* but you were seduced by the 0.75% daily interest. The most successful agencies I work with get challenges and problems but they make brave ballsy decisions not to mortgage the future to hit today’s target. It’s also easier to make brave decisions when you’re profitable (20%+ net profit) Here’s the Catch 22; in order to achieve 20%+ net profit you need to be braver and smarter with your pricing and how you run the agency. The challenges facing agencies today mean the agency’s senior team needs to be smarter than ever. They need to stop and think in order to make better decisions. 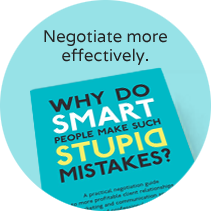 That’s what I help my agency clients do – make smarter, more profitable, more commercial decisions. *seen on Wonga’s website on 30th May 2018.